OTS Fitness is proud to introduce RugbyFit Bootcamp: the 1-hour fitness session to improve strength, endurance, and athleticism, based on the foundations of the best team sport around!! Are you tired of bootcamp classes with the same old 3 exercises over and over again? 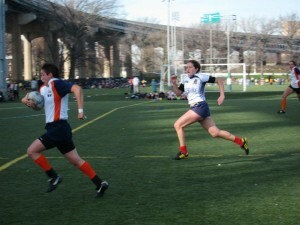 RugbyFit Bootcamp’s varied drills focus on all aspects of athleticism. We keep it interesting and mentally challenging to keep your brain engaged in more than just how tired you are. With Beginner and Intermediate level classes, RugbyFit Bootcamps are for everyone. Even if you’ve never participated in sports before and have no interest in ever playing a sport, these classes are still for you! Beginner classes improve overall fitness and body composition in a fun and interesting environment while introducing the core concepts of athletic movement. Intermediate classes challenge the speed, agility, and fitness of more seasoned athletic individuals. The skills improved at a RugbyFit Bootcamp translate to many other sports, such as soccer, basketball, tennis, climbing, weightlifting, and running. But if you do develop an interest in playing rugby, after marked improvement in beginner and intermediate classes, you would be able to take part in the monthly Advanced Session, which incorporates our tackle bag, ruck pad, and passing to ensure you can safely and capably show off your hard-earned fitness on a rugby field. Beginner and Intermediate level classes are capped at 10 people per session. Many of the drills we do require a partner and some exercises involve body contact, so you are encouraged to bring a friend with you to share in the awesomeness! Details: Classes are $20 per person (cash), 1 hour in length, and outdoors. Wear sunscreen and bring enough water. Wear comfortable and durable exercise clothing and sneakers. You will be down on the turf occasionally and tank tops may be uncomfortable for that. Classes start PROMPTLY at the scheduled time with a dynamic warmup. Please arrive 5-10 minutes beforehand to ensure we are all at the correct field on time. Meeting Location: East River Park at the Delancey Street Overpass. We will then walk briefly to the available turf field space. Had a great time on Saturday. It was hard work but good work. I love when I have a class that you know you’ve really done a full body workout. Looking forward to feeling less and less sore each time! Had a great time today, thanks Dana! It felt great to get out there with a ball in hand and start rebuilding my strength and fitness. I am already looking forward to the soreness of recovering muscles and doing it all again next week! It was great to have you there and you were a trooper in the brutal heat!